Last year I rode the length of the C&O Canal as part of the No Wrong Plan tour. It’s a great tour, especially for first timers. I had previously ridden it in the opposite direction for my 2005 bike tour. Many of my friends keep talking about riding the length of the C&O Canal but they never seem to get around to it. As Flogini, the erstwhile spiritual adviser to the Rootchopper Institute, once said: “We only have today. Tomorrow may never come. 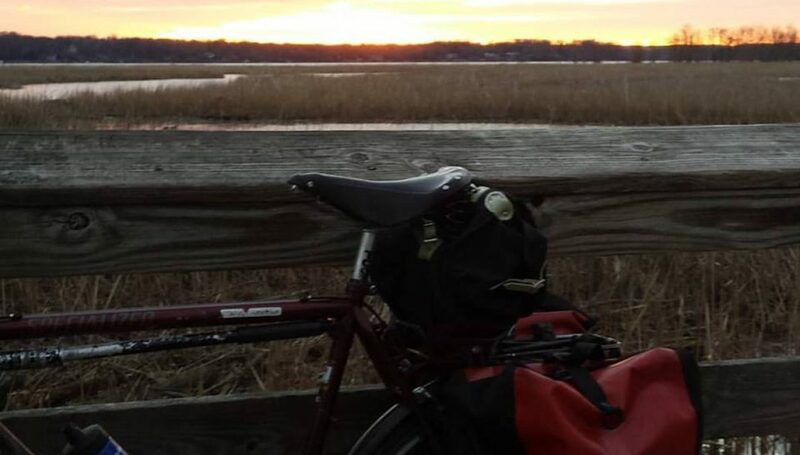 Stop planning and hoping and dreaming, and start doing!” I took her advice: in the last 18 months I have done 2 bike tours and visited nine countries. Flogini will be the death of me. You really should do this ride. (I am out of town that weekend or I would do it myself.) The logistics are a bit of a hassle though. There’s good news: if you are willing to do some fundraising WABA will solve the logistics issues for you. I even think they’ll cook you some s’mores if you ask nicely. So check it out over here. I can’t promise wildflowers for miles but if the weather gods cooperate you might just see some awesome foliage along the way. When baseball players get old, manager often rest them when a day game follows a night game. The Nationals did not rest their oldest player and I followed suit. Both decisions worked out pretty well. On Friday I rode to work as usual. I had not been to the first two games of the Nationals home stand because they were against the Orioles and Orioles fans are obnoxious. On Friday, the Colorado Rockies came to town so I decided to ride to the game after work. Just after parking my bike at the bike valet, I ran into Klarence. After about a 20 minute talk it became clear that Klarence seems to have won the happiness lottery. Seeing someone like this reminds me of Dave Stoller’s dad in Breaking Away: “I didn’t want you to be this miserable. A little bit’s all I asked for.” There’s not a little bit of miserable in Klarence these days. Way to go, Klarence. We split up on the way to our seats. Klarence, as usual, went to the cheap seats. I somehow managed to find a (relatively) inexpensive seat on the Club level behind home plate about 1/3rd of the way up in the stands. The concourse behind the seats is enclosed and air conditioned. I didn’t make much use of the posh concourse because it was breezy out, but the food selections are pretty decent. The game was fun. The home team won. I got to ride home in the dark which is one of my favorite things. On the way home. I saw two lights ahead in the dark. A young deer was standing next to the trail paralyzed by my headlight. A few minutes later I saw another set of lights. This time the critter ran off before I could id it. For some silly reason, I stayed up to almost 3 am. At 8:30 I crawled out of bed. Groggy. By 10:30 I was back on my bike headed for Nats Park for a 1 pm game. Without adequate sleep I was a zombie on the bike. Deets did his best to keep me moving forward but the headwind was not floating my boat one bit. My seats this day were out in left field. For most of the game I sat in the hot sun. I spent far more on fluids (soda and water, no beer) than my seat. A woman a few rows in front of me disappeared for an inning. She came back in different clothes. After about three hours, shadows from the first base side of the ball park brought cooling comfort. One way to tell how hot it was is to look at the picture below. Nearly all the fans in direct sunlight in the grandstand behind center and right field had evacuated. The game went into extra innings. They never got any shade. I suspect most of them had left anyway. Even though I hydrated like a camel, I woke up dehydrated. So no bike for me today. I will drive into DC to scout out parking for the 50 States Ride in two weeks. (It’s sold out but you can still participate for free by signing up to be a pit stop volunteer here or a course ride marshal here.) After my recon work, I will go over to Atlas Brew Works for the #bikedc fundraiser. I don’t plan on drinking but it will be a good chance to reconnect with #bikedc people after having been out of touch for most of the summer. Cheers. One of the benefits of bike commuting is good health. This year has been an exception for me. In May I missed two days of work recovering from a respiratory infection that resulted in an ambulance trip to the emergency room in the middle of the night. Scary stuff. Today, I missed another work day. I woke up at 2 am with cold sweats and a sour tummy. I sat in a comfy chair for two hours and felt crummy. I waited until my stomach calmed down and went back to bed. When the alarm went off I stayed down. I was groggy and just felt lousy. My head felt heavy. My tummy felt queasy. It was time to invoke the sick rule: if i am too sick to ride to work, I am too sick to go to work. Whenever I have violated this rule, and it’s been many a time, I have regretted it. So I stayed in bed for most of the morning. I couldn’t sleep so I practiced some breathing meditation. I’d have preferred a deep sleep but you take what you can get. At least I was relaxed when I got up. I hate wasting really good bike commuting weather but my tough-it-out days are over. I feel much better after a day of lazy about, eating, and reading. I feel better now. I feel better than James Brown. Tomorrow, I’m riding Deets to work. On the way home, I think I’ll take in a Nats game. And if that works out, I’ll go to the afternoon game on Saturday. There is no sick rule in baseball. Today on my ride home from work, the odometer on Deets, my Surly Cross Check hit 1,647 miles. That’s no big deal. I rode 8 more miles to home then added up all the miles from the odometers on my four bikes: 100,008 miles. I started this little project 25 years ago. I think I could use a shower beer right about now. I bought Deets, my Surly Cross Check, this time last year. I really haven’t ridden it much, if you can call 1,500 miles not much. Today that changed. I rode it to work for the first time. It was the fastest commute of the year. I can’t tell if it was the adrenaline of riding my newish bike or the bike itself. Deets has different gearing than my other bikes. Instead of three chainrings (the gears in front) and eight or nine cogs (the gears in the back), it has two chainrings and ten cogs. This set up is called a compact double. It is zoomier, because the gears are more bigger (and maybe because it weighs less than my other tanks, er, bikes). My old legs don’t like big gears but seeing as how they had no choice in the matter they turned the bigger gears which made me more faster. Something about the geometry of this bike makes it easier to ride standing up. This comes in handy when short hills are in the way .So I stood up a few times and the little hills seemed to disappear. The ride home was equally zoomy, despite a hot, muggy headwind. I think I cut five minutes off my normal commuting time. This was fortunate because dark clouds were forming overhead. Yay, speed. I think I’ll ride Deets again tomorrow. Oh two one three four! Many years ago some loony at the Washington Area Bicyclists Association (WABA) concocted a ride through all eight wards of the District of Columbia. As the name implies, the 50 States Ride takes participants along each of the 50 roads named for states in DC. Another fun part of the ride is the 9-page cue sheet. It is practically impossible to do the ride without making a wrong turn. The route changes from year to year so even experienced riders screw up. I missed the second turn in 2014 and I’d done the ride six times. The frequent stops and insane directions have an added benefit: they practically force you to talk with the other riders, many of whom will be strangers (unless you are one of those creepy people with over 1,500 Facebook friends). If you don’t meet people on this ride, you may have deep personal issues. I first did this ride in 2006. As I have said many times before, the 50 States Ride is responsible for me meeting over 60 people. Here’s another benefit: when you do the ride several times over the years you get to see first hand the incredible transformation that has occured in DC. A friend of mine and I have done the ride together twice. In January 2012 we attended a WABA happy hour at a bar near Nationals Park. She remarked that she had never been in this section of the city before. When I told her that we had ridden past that very spot only three years before, her jaw dropped. In order to do the ride, you must be a WABA member. So click on the link up above and sign up. This year’s ride is on Saturday, September 10. I will be out there for the 8th time this year. Somebody give me a push up Garfield Street please.